David attended Fort Lewis College where he received a B.A. in Exercise Science in 2006. David grew up as a football player and played for Fort Lewis, and then became the defensive line coach for the team. After experiencing a hip injury while playing football in Europe, he was forced to adapt to new ways of training. Balance, coordination, alignment and working primarily with gravity (body weight) became his focus. Having been the strongest power lifter at the college, (which he would never tell you! ), this new way of training opened his mind and body to the benefits and amazing results of functional fitness. His excitement and belief in functional training brought him back to coaching where he became the strength and conditioning coach for the FLC volleyball and football teams. David loves helping others achieve their physical potential. He has been a personal trainer for numerous elite athletes as well as high school kids and people of all stages of life who are looking to achieve their fitness goals. Recently David became qualified as a yoga instructor after completing Jill Lawsons 200 hour YTT. 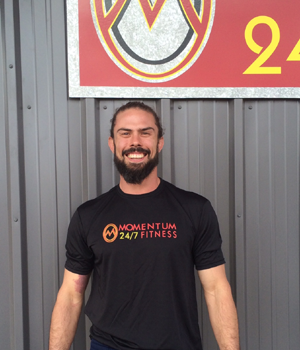 David brings his big smile and true enthusiasm for physical training to his classes and private training at Momentum Fitness. Outside of the gym, David loves gardening, is an acrobatic performer, practices yoga, and loves getting into nature.